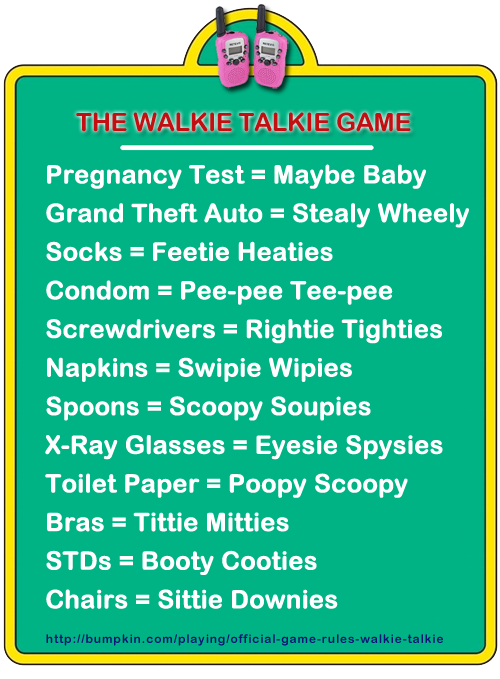 A recent flurry of alliterations on the Internet has birthed a new word game called Walkie Talkie where participants rename everyday items to rhymes. Parents should take care that any game of this nature tends toward the profane. Parental guidance is suggested when following these Walkie Talkie official game rules. A player is chosen at random to start the game, and begins by naming any object. Players then take turns to add words to this object, with the aim being to avoid completing the actual word. Words must feature a rhyme or alliteration. If the challenged player can successfully come up with a word, the challenger loses the round; otherwise the challenged player loses the round. If a player bluffs, or completes a word without other players approving of the rhyme or alliteration, then play continues. When a round ends, play generally passes to the left. If any score is kept at all, the traditional method uses the letters of the word “WALIKE TALKIE” in the same fashion as the basketball game HORSE, with each loss giving the player the next letter of the word, and a player being eliminated when they have all five letters. These are the walkie talkie official game rules that we have found success with our children. Please let us know any modifications that you might make!